Tenerife North airport in Spain, also known as Los Rodeos, is the closest one to the capital city of the island –Santa Cruz de Tenerife– as well as to the municipalities of La Laguna and Tacoronte and the Teide National Park. This means not only easier access to the commercial and business activity taking place in the region, but also staying in an ideal place to take hiking tours and discover the island. While TFN focuses on domestic and regional flights, Tenerife South receives a considerably higher volume of inbound international tourism because of its proximity to the holiday resorts of Costa Adeje and other beach areas. You can fly to Tenerife North from most Spanish cities and from the rest of the Canary Islands with Air Europa, Air Nostrum, Alitalia, Binter, CanaryFly, Evelop, Finnair, Iberia, Iberia Express, Norwegian Air, Royal Air Maroc, Ryanair and Vueling airlines. TFN has just one terminal divided into two levels. 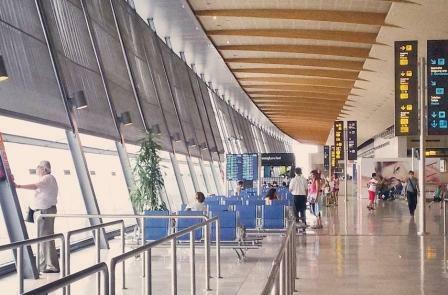 The level 0 or ground floor houses the check-in area, the security filter, the arrivals lounge and baggage claim area, cafés and shops and the car rental premises. Interisland flights have their boarding gates on level 0, however, for the great majority of the domestic ones, passengers go up to level 1 to board their planes. Next to the gates, some other restaurants and stores await, World Duty Free and Burger King among them. For your pre-flight meal, head for “Café & Tapas” before security and enjoy freshly brewed coffee and savoury baguette sandwiches. Once in the restricted area of level 0, you will get the chance to buy clothes and jewellery at GAP, Superdry and Lava or grab a last bite to eat before boarding at Panaria. Even if your designated gate is on the ground floor, you can spend time in level 1 as they are connected: Sunglass Hut, Tenerife Duty Free, Caffè Ritazza and Burger King will be your options upstairs. Providing you have just landed and want to hire a vehicle, the car rental offices are located on the ground floor and they stay open from 7:00 to 23:00 Monday through Sunday. The array of establishments to rent a car in Tenerife airport include those managed by companies like AutoReisen, Cicar, Avis, Hertz, Europcar and Goldcar Rental. Should you rather opt for using public transportation to travel to your hotel or accommodation in Tenerife, you can take bus line 20 (linking Los Rodeos airport-TFN with the capital city, Santa Cruz, as well as with La Laguna), line 30 towards the coastal area of Puerto de la Cruz or route 343 towards Costa Adeje and Los Cristianos. If by any chance you get to the wrong airport in Tenerife, Canary Islands, you will be glad to know that route 343 actually connects Tenerife North and Tenerife South International airport on its way to the northern part of the island and also when it transports passengers to the tourist resorts in the south. The journey takes just about 50 minutes to be completed.